The Creative Age: The Spill should Spell "CHANGE!" - An artist takes a small step, stops using oil paints as a message. The Spill should Spell "CHANGE!" - An artist takes a small step, stops using oil paints as a message. Well, many of you probably think I've lost it. NOW what is she doing...opening a new Facebook Page and beginning a website: OceansForChange.org? Well, I reserve my right to be female, and an environmental artist: I can change my mind AND adapt to the world around me as it needs me to. Go with the flow - and, in this case, go with the flow of the devastation of oil in our precious Gulf - which essentially in my mind spells the need for change by us all. Carl Safina posted an incredible perspective today on the catastrophic oil spill, "Spill Baby Spill"...it really baked my noodle, that's for sure. Thank you, Carl, for being a voice of reason. You are not shoving radical concepts down people's throats, and you are not sitting idly by as the toxic oil threatens to shove itself down the throats of precious wildlife that are the most intricate part of the ecosystem that keeps our oceans thriving. but, not one that mandates what people do (can't step on freedom, just make bad things uncool, like we have with smoking), and definitely not change that will cause major economic damage, nor change that provides a constant hand-out to those who do not wish to earn what they have - yet what a about a change of mindset, just a change in our attitudes that one step is at least a start? How can we begin to at least TRY to be more responsible and preserve earth for our families and our grandchildrens' future? Open our minds to go with the flow...adapt like nature has to adapt? (Note: Earth does not belong to US, we get the priviledge being here to enjoy it, not destroy it.) This is what OceansForLife.org is going to be all about...simply a place to begin the conversation for change - and the necessary message that Sylvia Earle has been striving to drive home for years, that our Oceans are the foundation of life here on earth. You can learn more about Sylvia and this vital message that we need to drive home either through her talk on TED posted at Mission-Blue.org, or by grabbing her book "The World is Blue: How Our Fate and the Ocean's Are One." The World Is Blue: How Our Fate and the Ocean's Are One . What can each of us do that is a REALISTIC step? Even if it's just ONE behavior, at least it 's SOMETHING, it's a start! Example: Stop using plastic bags at the store! Did you know these bags, beyond less than 10% are actually recycled, end up being mistaken by sea turtles for jellyfish? Learn more about the damage of just this one item, and some options at Earthsource.org. Just buy sturdy canvas shopping totes that will last, and keep them handy - it's just a change of habit, that's all! So, to share briefly before I head over to the West Coast of Florida tomorrow to see what I can do as an artist to help organizations prepare, I spelled CHANGE from the spill immediately through the shift to acrylic paints. Even though my shift is a grain of sand in comparison to the horrible damage from this spill, it is still an obligation and a step I can take to honor the losses that are pending and move toward change. Imagine if each person takes one small step. Many people feel helpless right now in how they can help, and the best way to help the environmental organizations right now is to stand by them with moral support, change lifestyle habits within reason, and of course send them money (we know that BP is not just going to wire them funds tomorrow, and they need resources now to prepare). 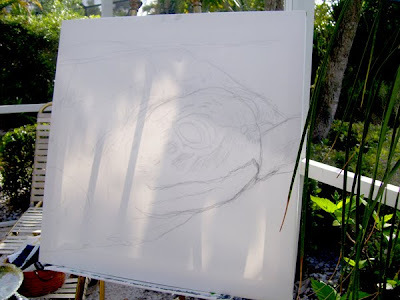 See here the canvas with "Turtwig" yearning to be painted, with the "Oil" paints next to it. What a mess, I thought! 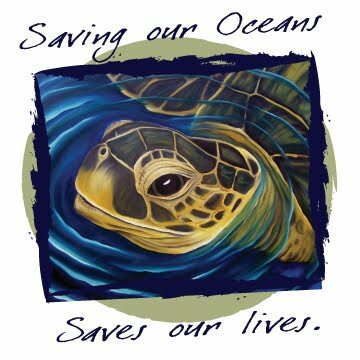 I woke up in the middle of the night last night realizing I needed to make a shift...what an oxymoron it would be if I continued to paint with oil paints (very toxic, and just that fact that they are oils during this spill, and soon to affect sea turtles)! No more. I have been planning my earth-friendly art shift for quite some time - even though I absolutely love the effects of oils, I know similar effects can be created with acrylics, and watercolors are also an earth-friendly option. The main point is, I MUST do what I can to push the message. So, as I stare at my fighter Turtwig (who is currently healing from a likely boat injury to his spine) waiting to emerge on the canvas...I make my official announcement to shift to acrylics and watercolors for now in light of the oil spill. Off to shop for my new paints...Turtwig, I'll be right back! 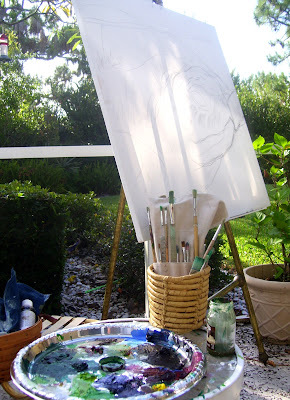 (my next shift will be to ride my bike to the art store...yet it would take me all day here in Hobe Sound!). Thanks for reading this, and please, SHARE this story with a friend, and then, share just one CHANGE YOU COULD MAKE to your daily life to begin to bring something positive out of this catastrophe (so something good may come from the horrible suffering of our creatures and Southern economies), on Oceans for Life FACEBOOK page, or, shoot me a note and I'll collect responses and post. We're all in this together, because we all created this mess together. Let's just all take responsibility for this mess however we can. Wish me luck on my shift to acrylic painting! Will try to video some of the progress. Turtwig will be immortal on canvas soon, just like Neal! 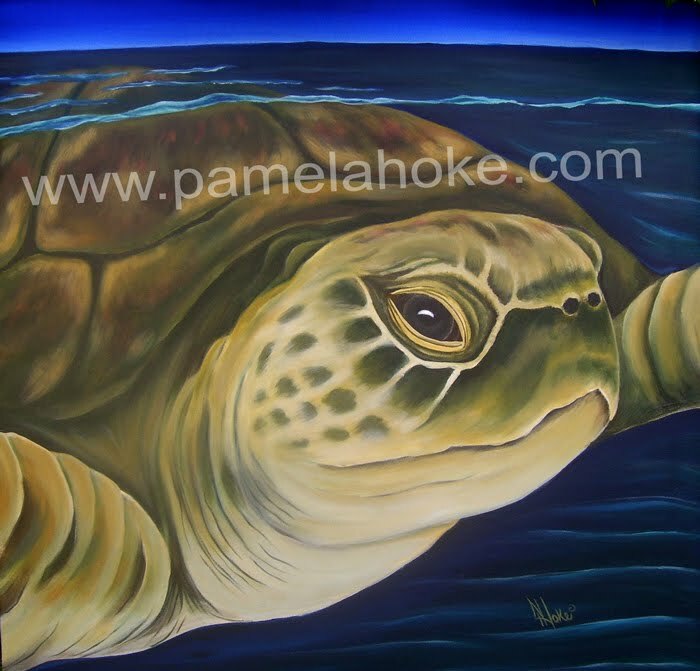 (Please visit my site , consider purchasing my turtle portraits or my other artwork, prints, canvas shopping bags and more to help me on my mission (20% of proceeds in my Passionate Purpose Section go to non-profit organizations that relate to the art. I will be adding more this week after my trip to the West Coast of Florida once I assess the needs of the organizations there). You can also help me by just telling a friend about my story and inviting them to join me on Facebook! Thank you!